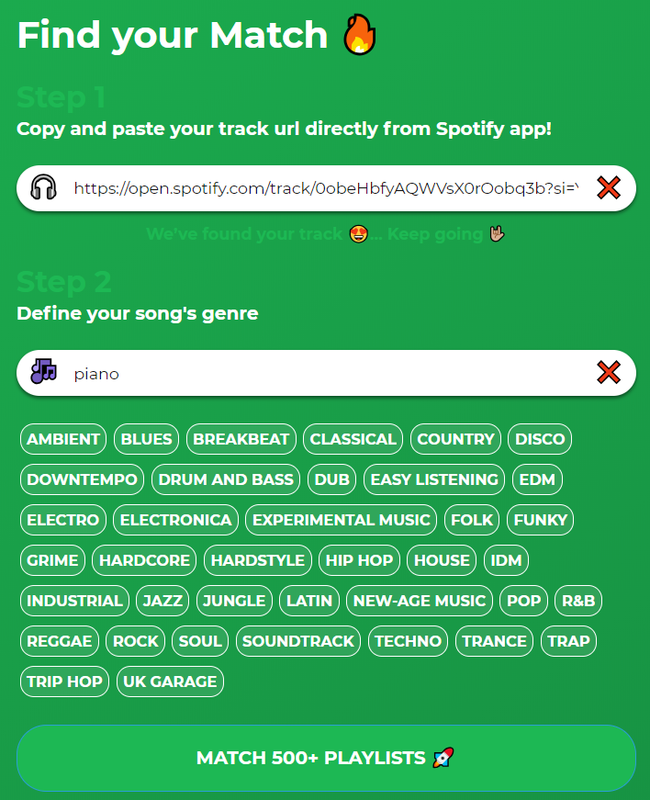 Choose and select the genre of your song (example: “piano”). It is very important to choose a genre compatible with your song for insure a high accuracy of the results. Click Search and find your Match! On the same page, you will see a list of playlists popping up, ranked by match rate, express in percentage. 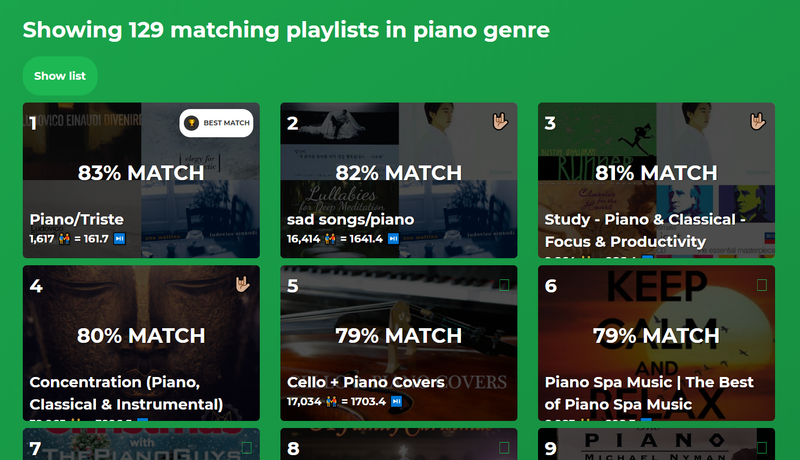 For each matched playlists, SpotiMatch provides its title, the fit with your song (e.g. 82% MATCH), its number of followers and the potential reach of your song if it was included in that playlist. 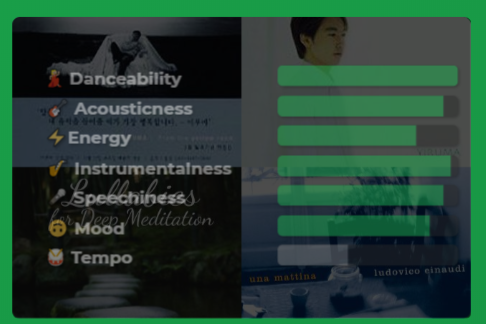 Mouse over each playlists to see some details about the fit on each feature for your song: Danceability, Acousticness, Energy, Instrumentalness, Speechiness, Mood, Tempo. Click on a specific playlist to get more info about the playlist and access the playlist’s contacts. Click “Push to playlist” to submit your song to the playlist and to get the playlist’s owner contact info: email and social media. 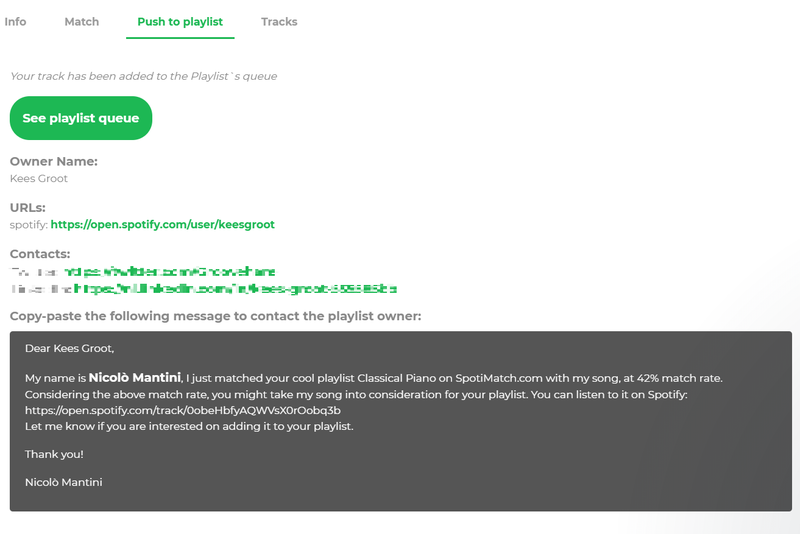 If you want to contact the playlist, you can copy paste the message template that appears below the contact info. If no contact info is provided, we will help you to get in contact with the playlist curators, in exchange of a share on social media! Go your activity history (click to your avatar to access) to get the list of the tracks you submitted, the artist(s) of the tracks and the number of playlists you submitted the track to. Expand “show playlist” to see the entire list of playlists for one track. Full list of playlists where you have submitted your track to. If you are a playlist curator, navigate to the curator page and copy and paste your playlist URL. You will get a table similar to the one in the picture below. The status shows whether a track is in the playlists ( ✅) or is in waiting list ( ⌛). 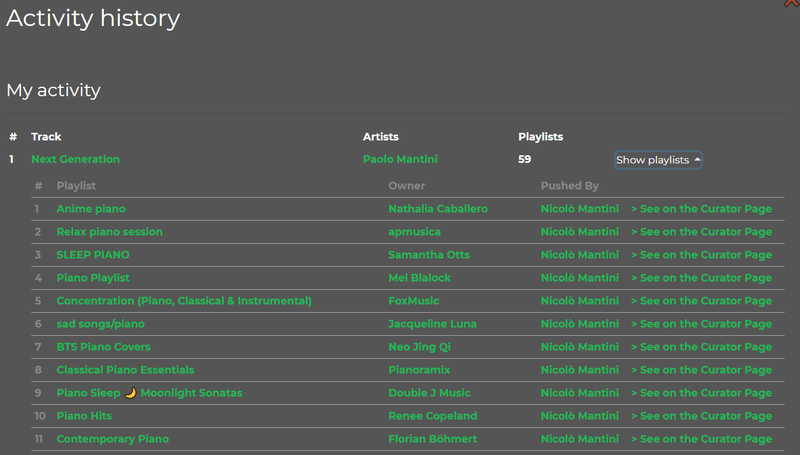 Curator page: input your playlist URL and get the queue of tracks that have been submitted to your playlist. The status shows whether a track is in the playlists ( ✅) or is in waiting list ( ⌛). The basic version of Spotimatch is free. However, if you are a professional and intend to use the tool intensively, we kindly ask to support the hard work done by people to maintain and develop the the application. The existence and success of SpotiMatch depends on you. That is why we ask for a donation to be able to keep developing SpotiMatch. Pick the one that fits you, subscriptions start at only €4.99/month. Artist Basic: Are you an independent Spotify artist? Submit up to 10 unique track, to 500 playlists every month, on Spotimatch.com. Artist Pro: Do you earn money with your music on Spotify? Submit up to 10 unique track, to unlimited playlists every month, on Spotimatch.com. Curator: Are you a curator of an independent playlist on Spotify? Would you like to promote your playlist? Feature your playlist on Spotimtach.com, for 1 genre. Agency: Are you a record label, Manager or booking agent? Manage unlimited artists at once! Submit unlimited tracks to unlimited playlists every month, on spotimatch.com. Sponsor: Become a sponsor with a monthly donation of at least $200 and get your logo on spotimatch.com with a link to your site. VIP: Let our Spotimatch team manage your account growth for 6 months. If you do not want to spend time contacting playlists, we can do that for you.Pitching your song to playlist is a service that we can provide, outside the scope of SpotiMatch. Please contact us if you want us to pitch your song on your behalf to a various number of playlists, taking into account the features, followers and performance of each playlist. Everybody is welcome to collaborate and contribute to the development of SpotiMatch. Trello: Whether you are a user or a developer, feel free to give us feedback and suggestions trough our open dashboard on Trello, click here to participate. Discord: We also have a Discord channel, open to everyone willing to contribute to the development of SpotiMatch. Click here to join the community on Discord! SpotiMatch is a tool sponsored by Clockbeats S.R.L. that uses Spotify data to calculate and display the fit between songs and playlists. The core algorithm is based on this Article. Do you know about MID-SIDE PROCESSING? Il primo Coworking di studi di produzione in Italia, a Brescia. Targato CLOCKBEATS!